We often see the repercussions of hazing when it emerges from the locker room and finds its way into the courtroom. And it's likely that courts will begin to see more hazing-related claims stemming from an alleged lack of appropriate student supervision. Statutes and common law decisions reinforce the duty of school officials to exercise care to protect children from harm - a legally enforceable obligation for schools. 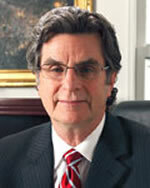 Care is an element assessed when considering a complaint or defense involving negligence. Did the school, through its administration and/or other employees, act appropriately, reasonably, with care and within the professional standard under the circumstance? This duty refers to a responsibility to protect others from unreasonable risk of harm arising from inappropriate student interactions, including hazing. Exercising this duty begins with schools developing and implementing adequate policies against high school hazing, training coaches and students about those policies, promptly investigating complaints, appropriately supervising staff and students, and following through with consequences for violators. By doing this schools send a clear message to students and staff that hazing and other inappropriate behaviors are neither tolerated nor acceptable in school athletics. Recently in Sayreville, N.J., the superintendent ended the football season early in response to serious reports of locker room hazing at War Memorial High School that led to the arrests of seven student athletes and allegations of possible student-on-student sexual assault. In this case, a couple of legal repercussions will follow in response to the season's cancellation. If a victim files a civil lawsuit against the school, the legal questions will likely examine whether hazing constitutes bullying (New Jersey's Acting Commissioner of Education says it does) and whether the school appropriately trained its coaches to be aware of hazing and to take appropriate action to end it. Plaintiff's attorneys may also argue negligent hiring, supervision and retention of the coaching staff, negligent supervision of students, and negligent infliction of emotional harm, among other claims. Defendant's attorneys will likely argue that the school did everything properly in hiring and supervising coaches, that it developed and implemented appropriate policies, and that students were appropriately supervised during the time of the alleged incident. The answers will boil down to the school's duty and whether it acted reasonably when training and supervising coaches and students, implementing its own policies, and complying with state law to protect student athletes and prevent a hostile environment from festering inside the locker room. 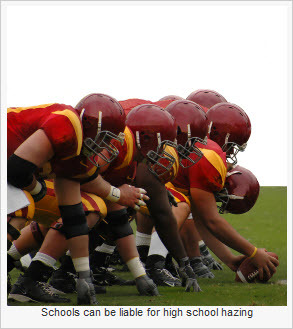 Schools' perceived attitude toward the acceptance of hazing in athletics can result in costly litigation when student athletes suffer injuries inflicted by fellow students or even coaches. For example, in an Ohio case, a high school football player's parents are suing over their teenager's brain injuries, blaming his coaches for allegedly sanctioning a dangerous hazing ritual. According to the lawsuit, other students hit the victim as hard as they could, causing him to collapse later in the locker room - and no ambulance was called. The suit claims that the ritual required their son to take deliberate injury, in violation of his rights, and that the coaches acted under the government's authority in ordering the intentional striking of the student. The suit also alleges that the school and coaches acted recklessly through complete failure to exercise any care to protect the student's safety and were indifferent to the fact that his injury was a likely outcome of the violence directed toward him. Here, the plaintiff's attorney will need to show that the state and school district had a policy defining the standard and that the school breached that standard, resulting in harm to the student. For its part, the school will need to demonstrate that policies and procedures were appropriate and reasonable, staff was hired and trained according to policy, if there was knowledge of the hazing, they took quick and appropriate action to end it. When the culture of high school hazing becomes so accepted that even the athletes themselves may not recognize the need to report an injury, hazing, or harassing behaviors, the abuse is allowed to continue - undetected and untreated. This sad reality causes difficulty for the plaintiff's attorney who wants to present a harassment claim alleging the school knew about inappropriate behaviors and acted deliberately indifferent to that behavior, resulting in harm to a student. In a survey of American middle and high school students published in School Psychology International, 66 percent of bullying victims believed that school personnel responded poorly when they saw children being bullied. Kids who are bullied often don't tell anyone, either because they think they won't be believed or they fear retaliation. It's not just targets of bullying and hazing who keep mum. Their peers do, too. Even though most students and athletes believe that hazing is wrong, witnesses rarely tell teachers and coaches, and they intervene only infrequently on the behalf of the child who is the target of the abuse. In fact, multiple studies suggest that only between 10 and 20 percent of noninvolved students provide any real help when another student is victimized. Student athletes worry that intervening will raise a bully's wrath and make them the next target. They may also feel powerless to do anything about it; after all, they are peers - they are not the teacher or coach in charge of fellow students. So they tend to stand aside, watch the negative and often abusive behavior, feel confused about what to do, and internalize conflicting feelings and emotions. This raises the duty of school employees to educate and train students about hazing and how to report what they see, take time to observe and assess the environment, and take action whenever a situation might cause harm to a student - be it unsafe conditions on the playground or interactions among students in the locker room. To promote a positive environment in locker rooms and to prevent high school hazing, it is important for schools to develop and implement an appropriate student code of conduct that includes athletes in the locker room and on the field. Hazing, specifically, must be prohibited, with strong consequences for violation. Teachers and coaches must be trained to take immediate and effective action to end hazing if it is reported or observed. Being able to demonstrate that the student code of conduct clearly addresses hazing and that teachers and coaches have been trained to take swift action will support a school in a lawsuit. School staff that consistently take immediate action and reinforce a positive school culture is the best deterrent to student harm - and the best defense in a lawsuit. Policies and training alone are not enough, however; if the school fails to show that it met its own standards, it will have difficulty defending itself against negligence and plaintiff's attorney may be able to demonstrate that failure to act reinforced a culture of hazing that contributed to student harm. As of the writing of this article the Middlesex County, N.J., prosecutor is conducting an investigation of the hazing and sexual abuse charges against the seven Sayreville football players; the school is waiting for the result before conducting its own investigation. There have been indications that parents will sue the school because it cancelled the football season, but these have yet to come forward. One player says he lost a college scholarship over the turn of events. Once the criminal part of the alleged harassment has been resolved, civil suits brought on by the victims will likely begin. Plaintiff and defendant attorneys should be prepared to address such issues as the coach's duty to protect students, whether the school reasonably and appropriately trained its coaches to detect and act against hazing, whether the coach knew or should have known of hazing behavior, and what he or she did to end it - and whether any breach caused injury to the athlete. Sayreville and similar high-profile incidents of high school hazing will likely bring many legal issues to the surface, including Title IX of the Education Amendments of 1972. When there are allegations or notice that locker room hazing involved sexual harassment, Title IX may be a viable avenue for a complaint and will complicate a review. Title IX imposes a duty on school officials to prevent sexual harassment in schools. According to U.S. Department of Education guidelines, sexual harassment occurs when a student experiences gender-based conduct by another student that is sufficiently severe, persistent, or pervasive that it limits a student's ability to participate in or benefit from an educational program or activity. Sexual harassment also occurs when such activity creates a hostile or abusive educational environment. If a Title IX sexual harassment claim is attached to a claim of hazing, plaintiff and defendant attorneys will need to examine the type, frequency, and duration of the conduct; the number of individuals involved; and whether the victim suffered psychological distress - in addition to whether the school met its duty to exercise care and whether it followed its own policies and professional standards under the circumstances.